In homemade how-to week 3, I just showed you how to make your first homemade pie crust from scratch. 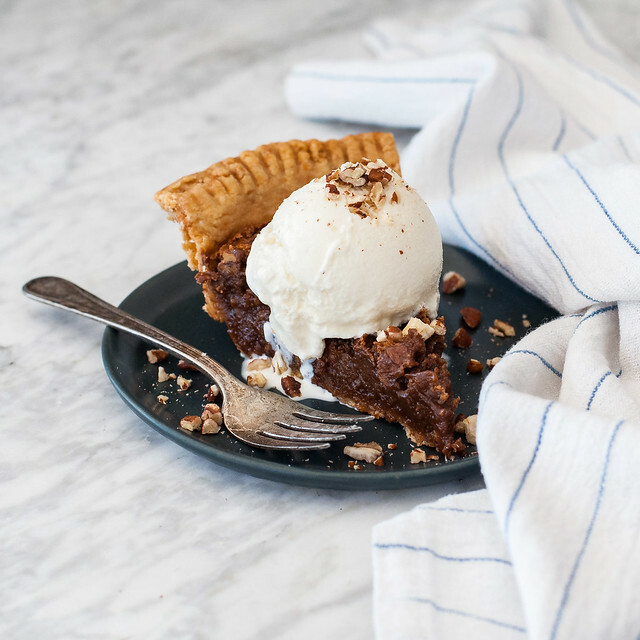 Pecan chocolate chess pie is the perfect easy pie, after all that effort for a homemade crust, to showcase your flaky, buttery pie crust (or store bought crust in a pinch!) with just a few simple filling ingredients. What a weird age of technology we live in: I’m constantly struggling with the conflict of just enjoying the moment or reaching for my phone, so I can capture it and relive the humor or beauty again and again. 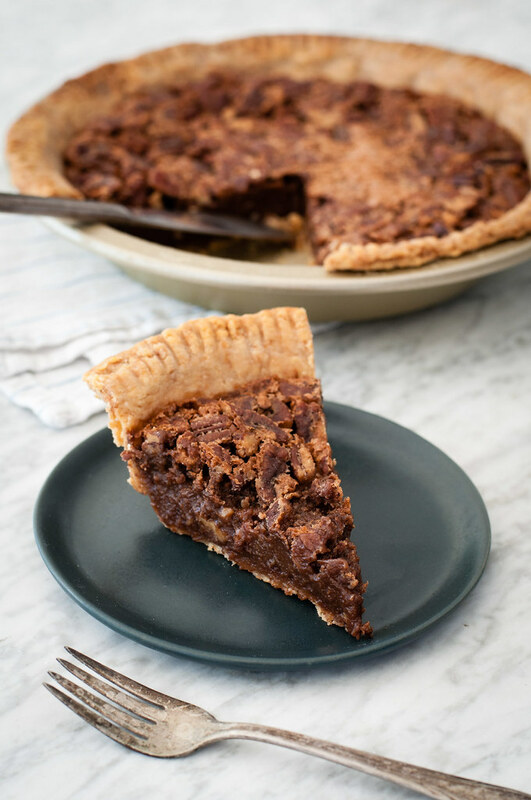 Right now I would kill to include a video from Thanksgiving with this recipe, of the moment a guest took their first bite of this chocolate chess pie creation that my sister Tristyn baked and none of us had ever heard of given our northern roots. A random recipe she found on the internet that looked plenty easy to bake at someone else’s house, with just a few ingredients, made lightning fast with a store bought pie crust but, as I’ve discovered, even more perfect with a fresh, buttery homemade crust. The reaction we witnessed–semi-human sounds between mouthfuls–could maybe be compared to a diapered one-year-old’s first experience with a cake all their own. It just goes to show that the best things in life are often simple. Like the puppy pets I’m sneaking in between writing sentences of this post, or the first warm spring day (come on spring!). 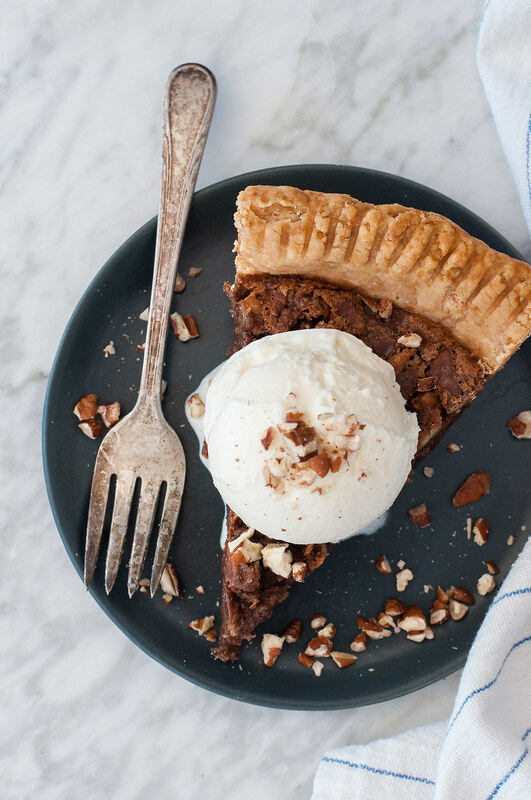 Pecan chocolate chess pie for dessert ranks right up there. Of course, I would be delighted to hear that you used my step-by-step tutorial to try your hand at homemade pie crust, but even I, when a chocolate craving strikes in the future, will probably be found making this pie with a store bought crust on occasion. It will elicit sighs and moans and devourings on any old night at home, or for your upcoming spring celebrations: maybe Easter or mother’s day, delivered with a bouquet of tulips. 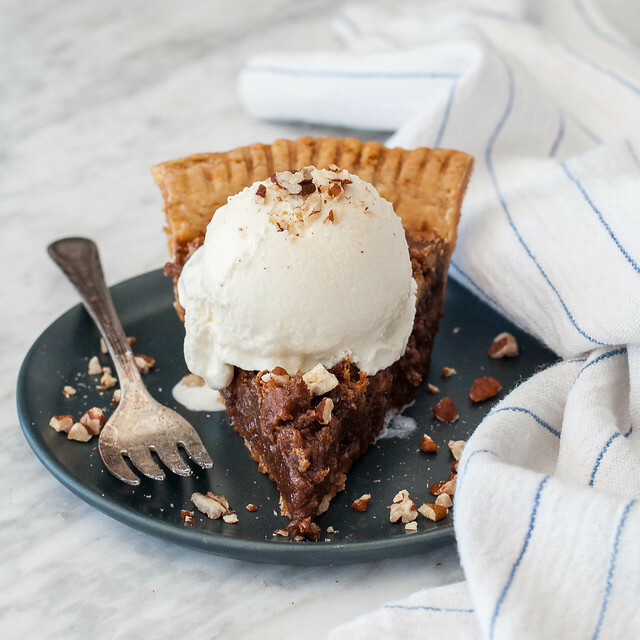 It’s conveniently best made in advance, so the custard-y filling has a chance to set in the fridge while the crackly pecan top stays crunchy as ever. 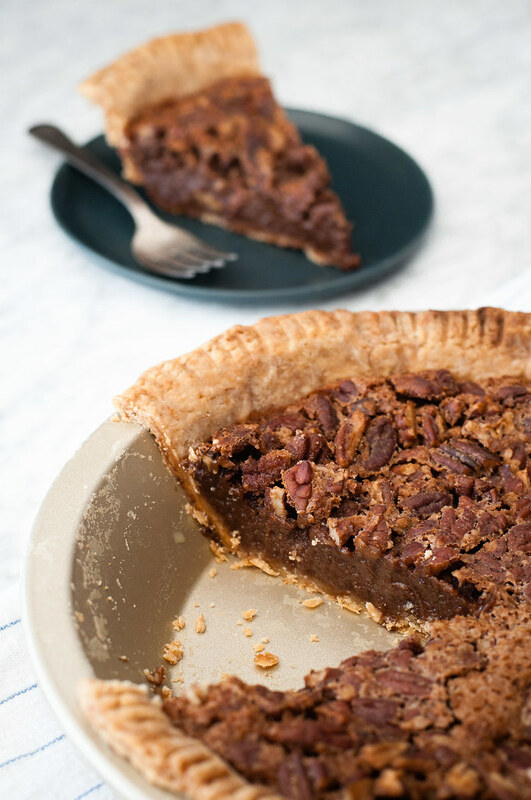 I wouldn’t directly compare it to pecan pie, but the way the filling caramelizes into a sticky toffee consistency where it meets the crust adds a nice element of complexity to an otherwise strictly chocolate dream pie. With or without ice cream or whipped cream piled on top, it’s one I’m adding to my short list of quick, impressive desserts for a crowd. If you have a crust at the ready, this playful, satisfying pie comes together in almost no time with easy pantry ingredients. Some versions call for a starchy flour or cornstarch thickener, but this one sets beautifully without any gluten or grains. The only hard part is waiting for it to cool and set before you dig in! 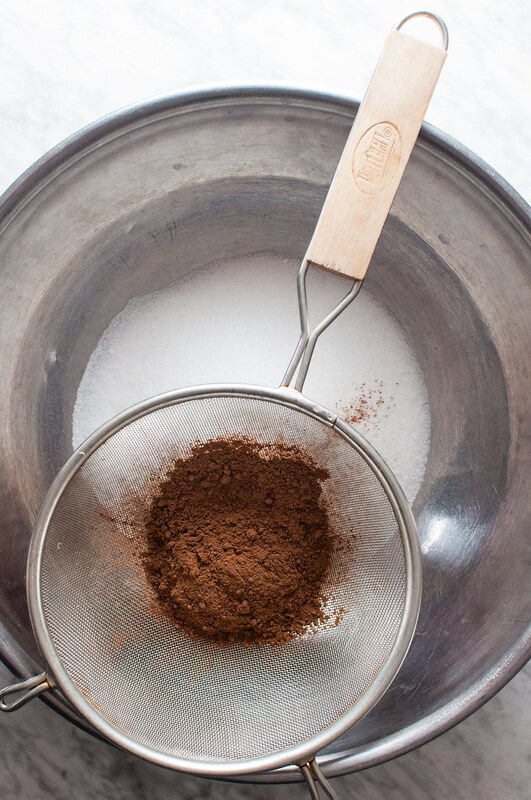 Sift cocoa powder into the sugar, add the salt, and whisk to combine. Stir in eggs, evaporated milk, vanilla, and melted butter until well mixed. 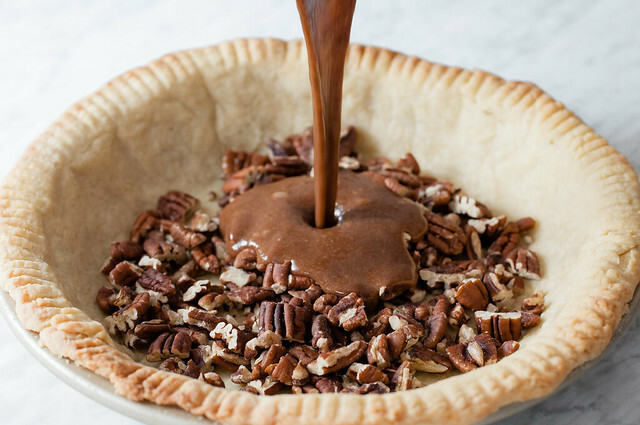 Sprinkle pecans evenly over the partially baked pie crust, then pour filling mixture over them (the pecans will rise). Bake 50 to 60 minutes until the pie is nearly set--it will still jiggle a little bit in the middle. 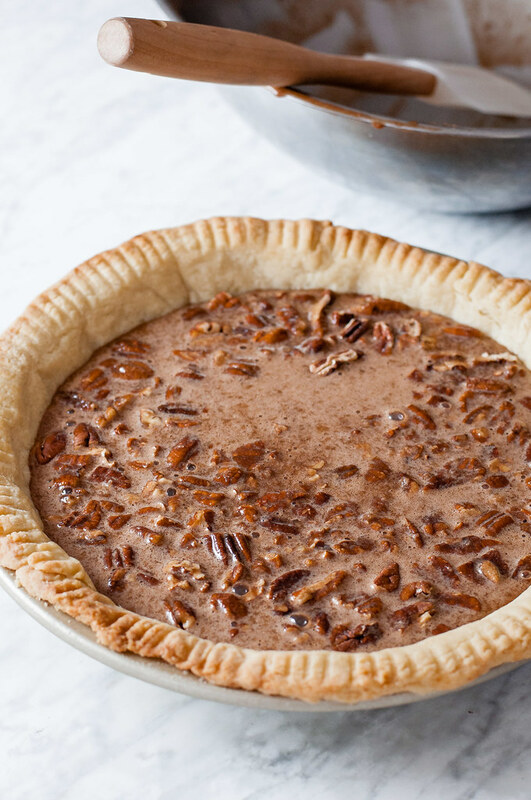 After 50 minutes, set a piece of foil over the pie to keep the pecans and crust from burning. Cool completely on a wire rack (or chill) before serving with whipped cream or ice cream, and a sprinkle of extra pecans. Adapted from Spicy Southern Kitchen via Served Up With Love. I’ve made this pie many time. It always turns out great. I only use 1 cup of sugar. It’s plenty sweet.